One of the first major results from Galaxy Zoo wasn’t even Astronomical. It was Psychological. 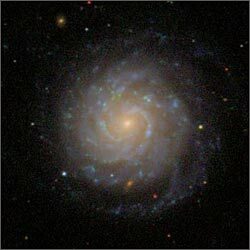 One of the questions in the original Galaxy Zoo asked whether spiral galaxy arms rotated clockwise or anti-clockwise; we wanted to check whether they were evenly distributed or whether there was some intrinsic property of the Universe that caused galaxies to rotate one way or the other. 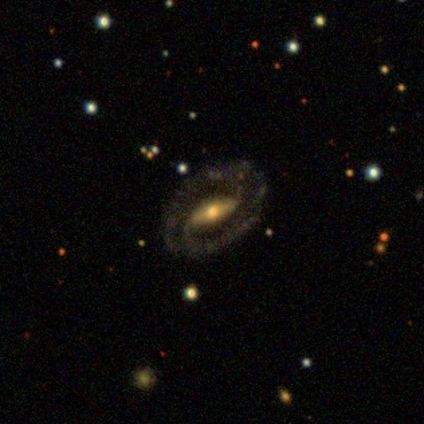 When the Science team came to analyse the results they found an excess of anti-clockwise spinning spiral galaxies. But when the team double checked this bias by asking people to classify the same image that had been flipped there was still an excess of anti-clockwise classifications; so it’s not an astronomical phenomenon. Turns out that the human brain has real difficultly discerning between something rotating clockwise or anti clockwise; check out this video if you don’t believe me – you can watch the dancer rotate both ways! Once we’d measured this effect we could adjust for it, and we went on to establish that spirals which were near each other tending to rotate in the same direction. The enigmatic blue ellipticals in many ways started the Galaxy Zoo. Galaxies largely divide into two: spiral galaxies like our Milky Way shining with the blue light of young stars being constantly born, and the “rugby ball-shaped” elliptical galaxies who no longer make new stars and thus glow in the warm, red light of old stars. Clearly, when galaxies stop making new stars, they also change their shape from spiral to elliptical. But how exactly does this happen? And what happens first? 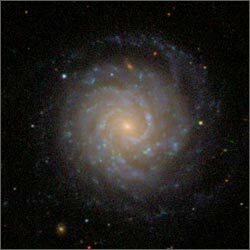 Do galaxies stop forming stars, and then change their shape, or the other way round? Answering that question is the first step in understanding the physics of transforming galaxies. With the Galaxy Zoo, we found a whole population of blue ellipticals: galaxies which have changed their shape, but still have young stars in them. With their help, we’ve been making a lot of progress in galaxy evolution. It looks like a galaxy merger, a giant cosmic collision, changes the shape of galaxies from spiral to elliptical and then somehow – and very rapidly! – star formation stops. We don’t know quite why yet, but we think active black holes are involved. This is hugely relevant for us as in a few short billion years, the Milky Way will crash into our neighbour, the spiral Andromeda galaxy. And for a short time, the Milky Way and Andromeda will be a blue elliptical before star formation in the newly-formed Milky-Dromeda ceases. For ever. A normal red elliptical and normal blue spiral on the top row. Unusual discoveries of blue ellipticals and red spirals on the bottom row. 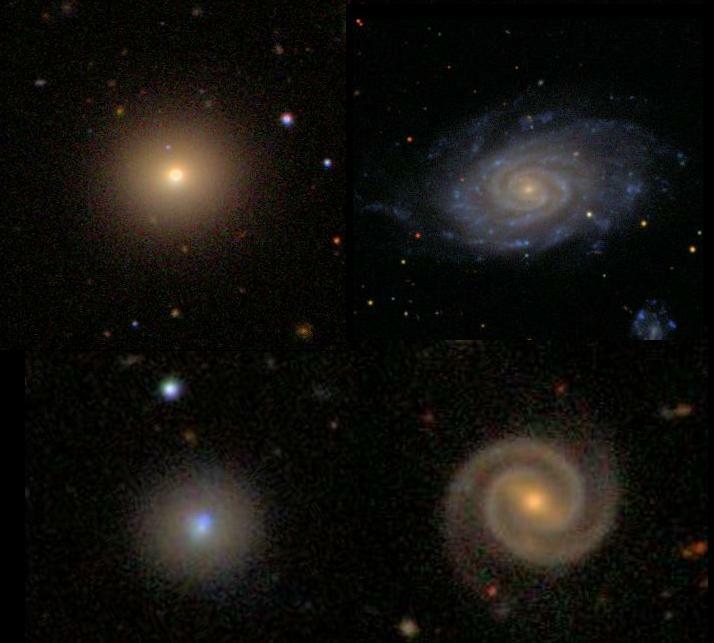 Ellipticals are red, Spirals are blue, Or so at least we thought, until Galaxy Zoo…. Think of your typical spiral galaxy and you’ll probably picture it looking rather blueish. Thats’s what astronomers used to think as well – suggest a red spiral to Edwin Hubble and he probably would’ve told you not to be so ridiculous. Before Galaxy Zoo if astronomers saw something looking red they generally tended to think it was elliptical; however to the untrained eye, the colour does not bias any classifications, which means that you all found lots of red spirals and discs which were hiding in plain sight. This put the cat amongst the pigeons for our galaxy evolution theories because, as said earlier, we thought that when galaxies stop making new stars, they also change their shape from spiral to elliptical. The red spirals mean that we now have a different evolutionary path for a spiral galaxy where it can stop making new stars and yet not change its shape. We now think that those spiral galaxies which are isolated in space and don’t interact with any neighbours are the ones that make it to the red spiral stage. The Green Peas, discovered by Citizen Scientists due to their peculiar bright green colour and small size, are a local window into processes at work in the early Universe. Although, they were in the data for many years, it took humans looking at them to recognise them as a class of objects worth investigating. First noticed in some of the earliest posts of the Galaxy Zoo Forum in 2007, a group of dedicated citizen scientists organised a focused hunt for these objects finding hundreds of them by the summer of 2008, when the Galaxy Zoo science team began a closer look at the sample. The Peas are very compact galaxies, without much mass, who turn out new stars at incredible rates (up to several times more than our entire Milky Way Galaxy!). These extreme episodes of star formation are more common to galaxies in the early Universe, which can only be directly observed very far away at high redshifts. In contrast to the distant galaxies, the Peas provide accessible laboratories that can be observed in much greater detail, allowing for new studies of star formation processes. Since their initial discovery, the Peas have been studied at many wavelengths, including Radio, Infrared, Optical, UV and X-ray observations and detailed spectroscopic studies of their stellar content. These galaxies provide a unique probe of a short and extreme phase of evolution that is fundamental to our understanding of the formation of the galaxies that exist today. Probably the most famous new discovery of Galaxy Zoo has been Hanny’s Voørwerp. 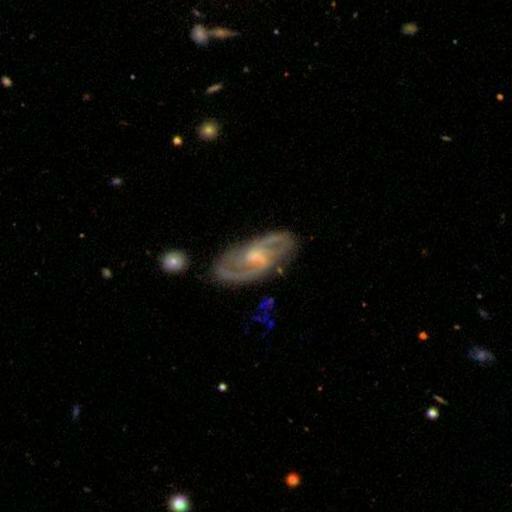 Hanny van Arkel called attention to it within the first few weeks of the Galaxy Zoo forum with the innocent question ”What’s the blue stuff?”, pointing to the SDSS image of the spiral galaxy IC 2497. The Sloan data alone could indicate a gas cloud in our own Galaxy, a distant star-forming region, or even a young galaxy in the early Universe seen 10 billion light-years away. After a chase to obtain new data, above all measurements of the cloud’s spectrum, with telescopes worldwide, an unexpected answer emerged – this galaxy-sized cloud was something unprecedented – an ionization echo. The core of the galaxy hosted a brilliant quasar recently on cosmic scales, one which essentially turned off right before our view of it (so we see the gas, up to 100,000 light-years away from it, shining due to ultraviolet light form the quasar before it faded). This had never before been observed, and provides a new way to study the history of mass surrounding giant black holes. Further observations involved the Hubble Space Telescope and Chandra X-ray Observatory (among others), filling in this historic view. The cloud itself is part of an enormous stream of hydrogen, stretching nearly 300,000 light-years, probably the remnant of a merging collision with another galaxy. As it began to fade, the quasar started to blow out streams of energetic particles, triggering formation of stars in one region and blowing a gaseous bubble within the galaxy. In keeping with the nature of Galaxy Zoo, the science team deliberately had much of this unveiling play out in full view, with blog entries detailing how ideas were being confronted with new data and finding themselves supported, discarded, or revised. The name Hanny’s Voørwerp (which has now entered the astronomical lexicon) originated when an English-speaking Zoo participant looked up “object” in a Dutch dictionary and used the result “Voørwerp” in a message back to Hanny van Arkel. Following this discovery, many Zoo volunteers participated in a focused search for more (the “Voørwerpjes”, a diminutive form of the word) – as a result we now know 20 such clouds, eight of which indicate fading nuclei. Other teams have found similar objects at smaller and larger distances; Hanny’s Voørwerp really started something! A galactic bar is a straight feature across a spiral galaxy. It’s the orbital motions of many millions of stars in the galaxy which line up to make these bars, and in computer simulations almost all galaxies will form bars really quickly. In the real world it’s been known for a long time that really strong (obvious) bars are found in about 30% of galaxies, while about 30% more have subtle (weak) bars. One of the big surprises about the Galaxy Zoo red spirals was just how many of them had bars. In fact we found that almost all of them had bars and this got the science team really curious. We followed this up with a full study of which kinds of spiral galaxies host bars using the first classifications from Galaxy Zoo 2. In this work we discovered a strong link between the colour of disc galaxies and how likely they are to have a bar – with redder discs much more likely to host bars. We now have half a dozen papers which study galactic bars found using Galaxy Zoo classifications. Put together these works are revealing the impact galactic bars have on the galaxy they live in. We have found evidence that bars may accelerate the processes which turn disc galaxies red, by driving material into the central regions to build up bulges, and clearing the disc of the fuel for future star formation. Supermassive black holes are the elusive anchors in the centres of nearly every galaxy. Though they may be supermassive, they are quite difficult to spot, except when they are actively growing — in which case they can be some of the most luminous objects in the entire Universe. But how exactly they grow, and why there seems to be a fixed mass ratio between galaxies and their central black holes, are puzzles we haven’t solved yet. We used to think that violent collisions between galaxies were The Way you needed to grow both a black hole and a galaxy so that you’d end up with the mass ratio that we observe. And violent collisions leave their signatures on galaxy shapes too. Namely: they destroy big, beautiful, ordered disks, re-arranging their stars into bulges or forming elliptical galaxies. So when we went looking for pure disk galaxies with no bulges and yet with growing central black holes we weren’t sure we would find any. But thanks to the volunteers’ classifications, we did. These galaxies with no history of violent interactions yet with large central supermassive black holes are helping us test fundamental theories of how galaxies form and evolve. And we are still looking for more of them! So here’s to SEVEN more years – keep classifying! Another cool fact about the peas is that our blog about them got us into a book – Michael Nielsen’s “Reinventing Discovery”. The peascorps’ dedicated trawling for peas and how to make sense of them was, apparently, extremely similar to the work of professional scientists – throwing out ideas, casting those that didn’t work aside, searching, pinpointing . . . and a lot of fun, too.